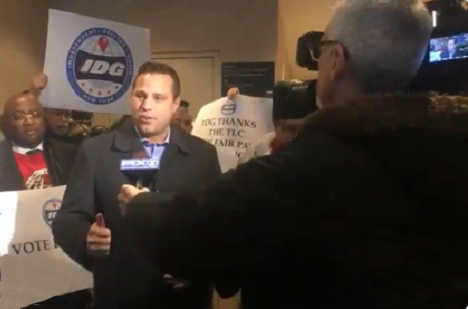 A two-year campaign by the worker-led and IAM-affiliated Independent Drivers Guild (IDG) paid off for drivers in New York City, after officials voted Tuesday morning to set the nation’s first minimum pay rate for app-based drivers. The rate, set at $17.22 per hour after expenses, is calculated by the city Taxi and Limousine Commission as the contractor equivalent of New York City’s employee minimum wage of $15 per hour. The rule, set to go into effect in 30 days, comes in response to a massive campaign by the IDG, including a petition to require a minimum pay rate for apps like Uber and Lyft that was signed by 16,000 drivers. Drivers also participated in many months of rallies, lobby days, and thousands of calls and letters to city officials. “Today we brought desperately needed relief to 80,000 working families. All workers deserve the protection of a fair, livable wage and we are proud to be setting the new bar for contractor workers’ rights in America,” said Jim Conigliaro Jr., founder of the Independent Drivers Guild. The Independent Drivers Guild is an affiliate of the Machinists Union which has represented and organized Black Car drivers for more than 20 years in New York City. The IDG is Uber, Lyft, Juno and Via drivers united for a fair for-hire vehicle industry.